You've probably heard of glucosamine and chondroitin supplements. They are certainly the most common supplements recommended for hip and joint health. While glucosamine and chondoitin can be beneficial for pets, Pupford Joint Supplements include both of these supplements and more to benefit your dog's overall joint health. Every dog has his own health needs, but one need they all share is joint support. Dogs are active. They run, jump, swim and play. This means their joints take quite a beating over the years. Instead of worrying about joint health when your dog is beginning to show signs of arthritis, it's best to take preventative measures. That's where supplement regiments, Pupford Joint Supplements, come in to play. They offer joint support for puppies, adult dogs and senior canines. Some breeds are genetically predisposed to hip and joint problems (study). Others show signs of joint pain at an earlier age due to overbreeding and inbreeding issues in the industry. For this reason, many veterinarians recommend starting your dog on a joint supplement when they are young. Whether you choose Pupford Joint Supplements or another type of joint supplement for your dog, you need to talk to your veterinarian about it first. Every dog has different needs, and your veterinarian can evaluate your dog to help you decide what the best joint care regiment will be for him. The Young Pups formula is designed for dogs 1-2 years old. It is designed to help the body begin to build strength and cartilage around the joints. The active ingredients are glucosamine hydrochloride (500 mg), chondroitin sulfate (100 mg), Vitamin C (100 mg), Zinc (15 mg), Vitamin E (15 IU), MSM (10 mg), Manganese (5 mg), Copper (2 mg) and Hyaluronic Acid (1.23 mg). Inactive ingredients include sucrose, cellulose, liver meal, stearic acid, magnesium stearate and silicon dioxide. The Adult Preventative formula is designed for dogs 3-7 years old. It is designed to strengthen and support joints. The active ingredients are glucosamine hydrochloride (500 mg), chondroitin sulfate (200 mg), Vitamin C (50 mg), Zinc (15 mg), Hyaluronic Acid (6 mg), Manganese (5 mg), Vitamin E (5 IU) and Copper (2 mg). Inactive ingredients include cellulose, liver meal, stearic acid, natural flavor, magnesium stearate, silicon dioxide and brewer's dried yeast. The Adult Advanced formula is designed for dogs that are over 7-years-old. It is designed to block pain impulses to help alleviate joint pain. It is also formulated to aid the body in producing more cortisol (a natural anti-inflammatory hormone) and building connective tissue around the joints. The active ingredients in the Adult Advanced formula of Pupford Joint Supplements are glucosamine hydrochloride (500 mg), chondroitin sulfate (400 mg), MSM (50 mg), Vitamin C (50 mg), Zinc (15 mg), Hyaluronic Acid (6 mg), Manganese (5 mg), Vitamin E (5 IU) and Copper (2 mg). Inactive ingredients include cellulose, liver meal, stearic acid, natural flavor, magnesium stearate, silicon dioxide and brewer's dried yeast. The Veterinary Strength formula is designed for senior dogs and dogs of any age or breed that are already showing signs of joint problems. The active ingredients are glucosamine hydrochloride (500 mg), chondroitin sulfate (200 mg), MSM (200 mg), Green Lipped Mussel (200 mg), Vitamin C (50 mg), Zinc (15 mg), Omega 3 Fatty Acids (13 mg), Hyaluronic Acid (10 mg), Manganese (5 mg), Copper (2 mg) Vitamin E (2 IU) and Omega 6 Fatty Acids (170 mcg). Inactive ingredients include liver meal, magnesium stearate, brewer's yeast, natural flavor silicon dioxide and stearic acid. A diet that includes green lipped muscles have been scientifically proven to help dogs who suffer from arthritis pain. While Pupford Joint Supplements are formulated by veterinarians, the company does not recommend their use on pregnant or nursing dogs or pets that are intended for breeding. At the time that this review was written, Pupford Joint Supplements are on sale on Amazon. They come in bottles containing 60 chewable tablets. You can purchase the Young Pups supplements for $12.99, the Adult Preventative supplements for $9.99, the Adult Advanced supplements for for $12.99 and the Veterinary Strength for $20.99. If you have a medium-sized dog that weighs 50 pounds, one bottle of these supplements will last you for 1 month. I know the cost won't fit into every pet owners budget, but just think of the savings you'll have on veterinary care and prescription pain meds if you use these preventative supplements instead. Of course, I couldn't test the effectiveness of these supplements in just a couple of months, but many pet owners have left stellar reviews on the company's website and Amazon. 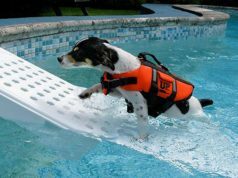 Some of them have been using these products for years and credit them with helping their dog's arthritis pain. The tablets are roughly the size of a quarter, so you may have to crush them up for extra-small breeds. 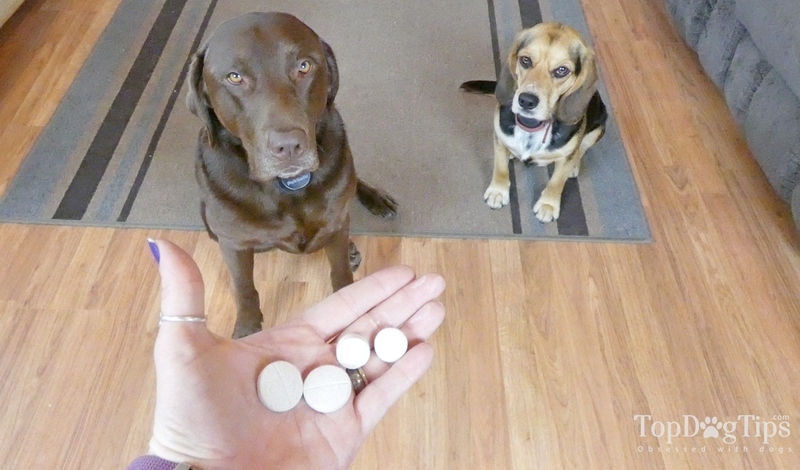 As you can see in my video review at the top of this review, our dogs ate all 4 levels of these tablets without a problem. They seem to enjoy the flavor and texture. Pupford has developed a line of joint supplements for dogs that includes a supplement for puppies, adult dogs and senior pets. Pupford Joint Supplements are formulated by veterinarians, and made with natural ingredients in the United States.